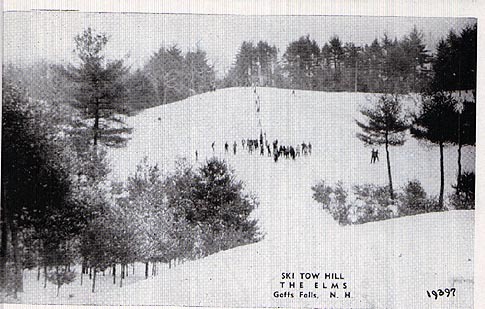 The Elms was a small rope tow ski area that operated as part of The Elms, a nearby hotel. 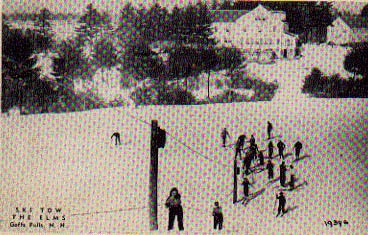 While short, the ski area did offer recreation for the hotel's guests. The area had a 175' tow during the 1930's/1940's, which was later lengthened to 300'. Robert L. Riccio: My Uncle Harry Coldwell was the proprietor of the Elms Hotel. I remember many wonderful snowy days spent going up the rope tow and down the hill. The hill was not very big, but to novices and little kids it afforded an unparalleled rush. There had been a ski jump on the biggest of the three slopes in the early days. It was still standing in the early to mid 1950's, but it was no longer used. Story goes that Eva Ross (one of uncle Harry's waitresses) had a 13 year old son who begged to take just one last jump. She agreed, he jumped, faltered and unfortunately broke his neck and died. I think that that incident was probably the end of the use of the ski jump. Uncle Harry was quite an innovator and he actually had a snow making set up for the hill. It was in the early days of snow making and I don't think that it was terribly effective. But it was fun to try to make snow. Jill Coldwell Neville: I am Jill Coldwell Neville, the daughter of Harry Coldwell who owned the Resort Hotel the Elms, prior to it becoming the Highlander Inn. My Grandparent's owned The Elms Hotel on the Merrimack River. It was severely damaged in the flood of 1936. They rebuilt the Hotel on the land that you see in the pictures on your web site, that would have been 1936-1937. That land was in the family for some time prior to building on it. There was recreation for the guests' on that land before there were buildings on it. The ski hill being one of the things the guests could avail themselves of. The guests were transported from the hotel to this recreation area. I would say that they were skiing and snowing shoeing on that hill long before the tow was put in. I would say the two was put in the mid 1930s. There was also a 10 meter ski jump there, that was torn down in the early 1950s primarily because of the liability. There are two things that I think are important about the site, there was night skiing and in the 1950s my Father started making snow. There were a number of reasons for the demise of the tow. Mc Intyre Ski area in Manchester was built, increased income and mobility of the population, and again liability. The insurance became astronomical and it simply wasn't practical operation anymore. Another thing is as the population became more sophisticated, they wanted bigger and better. The hill is no longer there because my Brother had the sand mined for the value of the sand. Kathy Marchetti Hughes: I read your article in the Globe today and it stirred my memory of The Elms, where my family and I spent several February vacations in the late 1960's. Many families from the Somerville/Arlington Ma. area would go there for the week of school vacation. The same families would return each year and many long term friendships developed over the years. The Elms was a wonderful place, where each family stayed in either the main house or one of the newer motel type units. It was run on the American Plan, where all meals were included. At mealtime the staff would go around to all the room and units ringing a bell to let people know that the dining room was open. The meals were served family style at large tables. There was a gameroom in the lower level of the main building where the teenage guests spent many evenings listening to the jukebox and playing ping pong, which we all became quite proficient at during those years. The Elms was a great place for kids and parents as it was a very safe, contained resort and we were pretty much allowed the run of the place with little parental supervision! Night skiing and ice skating was the big thrill, especially for the teenagers. As a forty+ parent of a nine year old, I wish it was still in existence. Although they didn't have any snowmaking capacity in those days, I don't ever remember there not being plenty of snow on which to ski. The hill (one could hardly call it a mountain) was great fun and so easy that we all had ourselves convinced that we were expert skiers. Were we surprised when many years later we discovered the magnitude of a ski area such as Loon Mountain! I would be happy to provide any other information you would like. Good luck with your very interesting project. bus about 10:30 or 11:00 with skis, poles and boots and make a transfer to another bus and had to walk 1/3 of a mile to make it to the Elms. Skied all afternoon and would go into a lounge like area and buy a Pepsi and chocolate bar and listen to the DUKE OF EARL and then take the bus back home just in time for dinner. And you know what, with all that I still had 15 cents left. Talk about getting your moneys worth, for a couple of years I had a season pass at Gunstock for $45. Tom Gorrell: I can recall in the early 1950s that we would go there for their "toboggan chute" as I recall it being called. This was a short but fast ice covered toboggan run and was quite a thrill for a young kid. I only vaguely remember the ski run, but I think my older brother knew about it. It seemed like such a big outdoor long distance adventure, even though we lived only twenty minutes away by car. From Lost Ski Areas--edition 20. "THE ELMS - For this one we didn't even have to leave the airport. On the access road to Manchester (NH) airport there is a hotel called The Highlander Inn (out near the long term parking). Behind the hotel is their conference center, called "The Elms", occupying buildings which were formerly "The Elms" hotel. The latter hotel had a small ski area many years ago. Loyal reader RALPH (NH) actually skied there in the mid-50's. He remembers it as one rope tow and 80-100 ft of vertical. Nothing remains. We have found only one reference in the literature: "Other NH rope tow areas" (1977): The Elms"."